then ‘Triumph over Type 2′ is the perfect programme for you. I know you’re a fighter and that you aren’t going to let this condition beat you. to get up and do all the things that will make you happy. You want to LIVE A HAPPY LIFE! ​You can’t just flick a switch, can you? To begin with, what are A, B and C? And if you have to run anywhere, EVER, you are just going to lie down, right now, and let the condition do its worst. I know I can help you… because I have Type 2 Diabetes too. When I got my diagnosis, I was determined to beat it. I didn’t know what that looked like and didn’t particularly know what I was going to do. But I’m bright and inquisitive and I ‘get’ things. I could work this out for myself, right? Well, I took the tablets. I went on a diet. I started to walk a little bit. I did what I was told by the doctor and the diabetic nurse. I listened to the dietician. It wasn’t easy. I relied on deprivation, determination and blind obedience. I did what I could but changes were slow and inconsistent; advice was basic and inflexible. I could really have used some individual support and guidance when I found myself resorting to guess-work. I chipped away, very gradually, at my numbers. When they went down, my nurse was happy for me. When they went up, I was prescribed more pills. I wasn’t exercising any more. I was eating whatever I could manage to prepare. I was stir-crazy, isolated and depressed. And so began the yo-yo effect of dieting – or not; exercising – or not; mood swings and stress. When I was ‘on my game’ I could restrict my food, and work out, like a maniac! I enjoyed it too. I had bathroom scales, kitchen scales, calorie bibles, a draw full of workout DVDs, and spreadsheets to die for. On top of all this, I had a gutful of grim determination. But I was like a clockwork toy. Wind me up and off I’d go, straight ahead at great speed, until I hit a wall. Then I’d turn turtle and give up until I either got my mojo back or got fat enough and sick enough to feel I had to try again. And yes, food restrictions, exercise and grim determination would once again get me back on the straight and narrow, until I hit the next wall. Even then, there were times when the results I got on the scale and in my blood work didn’t seem to reflect all my hard work. I was giving it everything, with no clear idea whether ‘everything’ was ‘enough’. Eventually I got serious about understanding my condition, learning about nutrition and fuelling my exercises appropriately. I did a nutrition diploma, which included weight management, sport and exercise, and psychology. I read books about macro nutrients, detoxing, and supplementation. I sat myself down and finally understood the relationship between insulin and blood glucose. Most importantly, I got some great advice on my personal issues, which had caused comfort eating and stuffing down my emotions – and that how I was thinking and feeling was way more important than what I was doing. I needed a sustainable way of life – not a torturous regime that I couldn’t maintain. For about 2 years I immersed myself in information. I became fanatical, evangelical about certain ways of eating and exercising, and even psychology. But still, the ‘results’ only came when I deployed the ‘grim determination’ switch – and they were temporary. ​And then the penny dropped. This is why even when we stoically follow conventional wisdom to the letter we can still fall short of our goals. This is why our doctor or nurse finds it hard to believe that our actions match our words when our blood work suggests otherwise. This is why we stop trying because nothing seems to work. I can help you to turn a life of sickness, frustration and confusion into one of vitality, calmness and clarity. You won’t have to read every book I’ve read, or try every supplement I’ve bought, or unpick the fact from the fiction on all the websites and forums I’ve trawled. And, no, you don’t have to join a gym either! You just have to get serious about identifying what works for you, and doing it. And I’ll be with you every step of the way. With that said, what can you expect from the ‘Triumph over Type 2′ programme? A measurable improvement in your blood glucose figures once you identify the lifestyle changes that work for you. Most important of all, you will have one-to-one attention from me as we explore your needs and how to fulfil them. This is NOT a ‘one size fits all’ programme! Clarifying where you are – including your hopes and concerns and well as your state of health – and crafting out your goals for this programme, and beyond. Ensuring you have a clear picture of what the condition amounts to and how that relates specifically to you. Understanding the fundamentals of food and then planning what you are going to eat. I know this is the thing most people want help with, and I can offer this as a stand-alone module. Learning that exercise doesn’t have to be brutal, time consuming or expensive but that even the smallest amounts reap huge benefits. Getting serious about state of mind: what’s stopping you from doing what you need to do to get healthy and what can you do about it? Identifying your support network – including members of the medical profession – and how you will make use of it. You are not alone. The future starts here. Planning your strategy to meet your goals and putting it into action. if you wish, bolt on the 4-week Advanced Package. This can only be done on a 1:1 basis to ensure it is properly tailored to your individual needs. you can chose to work just on your nutrition with me if you like. After that you may or may not decide to look at the Premium or Foundation package. Each week, no matter what option you chose, we will have a video coaching call. For all one-to-one options, each call will last 1 hour. We will schedule these at the start of the programme. For the group option, they will last up to 2 hours and will be at the same time every week. Some weeks you will receive a workbook from me to help you to understand, or work through, the topic in question. It may include directed reading, and exercises for you to complete before your next one-to-one coaching session. These exercises are about you – they are not lengthy assignments that require heavy research or endless reading. You will need to set aside at least 2-3 hours per week to do justice to your workbooks. The more you put into the exercises you receive, the more you will get out of them. I’ll be recommending some books and websites that I have found particularly useful on my own journey. There’s an ‘app’ for everything these days! I’ll suggest some that you might enjoy using to keep track of your blood glucose, food and physical activity. I’ll give you my exclusive Excel spreadsheet, with a collection of tabs that will help you organise your food and exercise, and monitor your blood glucose readings and weight. When you click the link to book a call you will schedule a time for this to take place. I will send you reminders so that you don’t miss your slot. Make sure you chose the right time zone! During the call, which may take up to 45 minutes, I will ask you about yourself and exactly what you’re hoping to achieve, and together we will decide if this programme is a good fit for you – and if so, which option will work best. If we decide to work together, we will complete your registration and payment at the end of the call, and this will be followed by the first of your materials arriving in your email inbox. But maybe you’ve done some, or all, of these things and you’re still sick, tired, scared and confused. Maybe you don’t want to listen to what other people are doing, and want to decide for yourself what’s right for you. Maybe you need someone who will help you – and only you – as you unpick what to eat, how to move and why you think the way you do. Maybe you don’t want to be passive anymore – you want to make things happen: experiment, test, question, collaborate – and then act in a way that makes sense to you, your body and your mind. This programme will allow for – indeed, INSIST upon – this. I will be sharing tools and theories within the exercises that I give you that I have tried and tested over decades as an instructor and a coach. I will be introducing methods of eating and exercises that you can CHOOSE FROM in order to achieve success. I will be showing you how to interpret the information you collect about your mind and body so that you can make informed decisions on what to do next. You will struggle with some of it. You will make mistakes. You will try things that don’t work. And that’s okay, because every ‘failure’ is a piece of data you can use to shape your future. Wouldn’t it be great to walk out of that appointment having wowed you nurse or having your doctor reduce your medication? It takes courage to be successful. It takes courage to abandon old habits and beliefs. It takes courage to change your life. You can’t wait to see the looks on the faces at your doctor’s surgery when you get your blood tests back! All because of a disease that can be put firmly into reverse gear with the right lifestyle choices, attitude and support. Any questions before you book that call…? No – absolutely not. That’s why I will not be advocating or recommending making any alterations to your prescribed drugs. That is between you and your doctor. But I will help you to understand the medications you are taking and the symptoms you are experiencing. That will depend on you. In the last few years there has been a major shift in the dietary recommendations for those with Type 2 Diabetes. We will explore these, and through discussion, experimentation and personal preference, we will decide what you will do. You may also wish to include your doctor in this process. I have no affiliation with any commercial organisation or individual and will gain nothing from helping you chose any specific food plan or way of eating. ​Will I have to buy exercise equipment? No, not if you don’t want to. A lot will depend on what type of exercise you feel inclined to do. I will, however, be making some low cost/easy store suggestions for you to consider. I have no affiliation with any commercial organisation or individual and will gain nothing from helping you chose any specific form of exercise. What times of day are you available to coach? I don’t just work office hours! This doesn’t work for international clients, nor does it work for UK clients who have a 9-5 job. Essentially, I am usually available during a 14-hour window (9:00am – 11:00pm, UK time), 4 days a week (Sunday – Wednesday), most of the time. 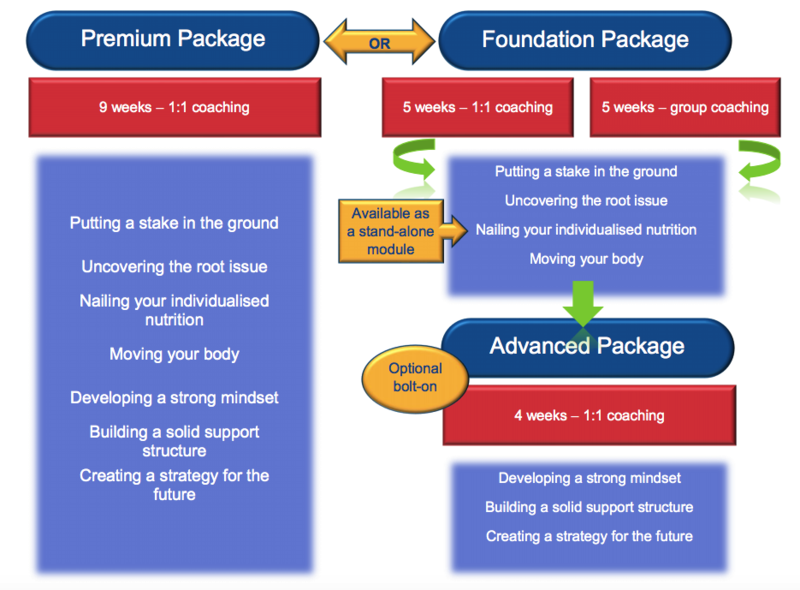 You will be able to see my availability when it’s time for you to book your coaching sessions. I’m sure you’ll find something to suit you. If there’s anything else I can help you with before you book your call, please email me at: support@patkirbycoachingservices.com.